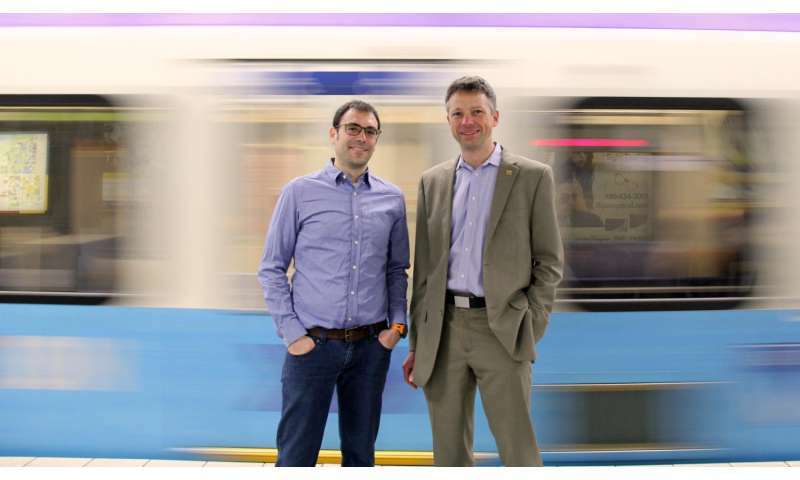 (Edmonton) University of Alberta mechanical engineering professors Pierre Mertiny and Marc Secanell are looking to make an old technology new again and save some money for transit train operators such as the Edmonton LRT while they do it. "The flywheel is an old technology, but that's partly what makes it so sensible," says Mertiny. "Fundamentally, it's a really simple technology. We already have everything we need." The two recently calculated that the use of flywheel technology to assist light rail transit in Edmonton., Alberta, would produce energy savings of 31 per cent and cost savings of 11 per cent. Their findings are published in the July 2016 edition of the journal Energy ("Analysis of a flywheel storage system for light rail transit"). Although we don't hear a lot about flywheel technology, it is used for 'high-end' applications, like the International Space Station or race cars built by Audi and Porsche. In North America, high-capacity flywheels are also used in areas of high population density, such as New York, Massachusetts and Pennsylvania, to buffer electricity to prevent power outages. Secanell and Mertiny examined the possibility of using flywheel technology to store energy generated when the city's LRT trains decelerate and stop. Trains such as the LRT are designed with so-called dynamic braking, using traction motors on the train's wheels, for smooth stops. But the deceleration generates energy, which needs to go somewhere. "Electric and fuel cell vehicles, already implement regenerative braking in order to store the energy produced during braking for start-up, so why would trains not be able to do so?" says Secanell, whose research also focuses on fuel cell vehicle technologies. Currently that electricity is considered 'dirty' electricity because it is intermittent and therefore difficult to use. Conventional systems simply send the braking electric power to resistors on the train, which convert the electrical energy to heat, which is then released into the air. A flywheel system would take the electrical energy and store it as mechanical energy. This mechanical energy could would then be converted back to electrical energy when the train is ready to leave the station again. "It's difficult to use a conventional battery for this purpose," explains Mertiny. "You need to recharge and discharge a lot of energy very quickly. Batteries don't last long under those conditions." Mertiny and Secanell predict that using a flywheel to capture the electricity generated by a train's deceleration and applying it for acceleration would produce an energy savings of 31 per cent and cost savings of 11 per cent on the Edmonton LRT system. A flywheel system could result in substantial energy and cost savings for the city. "The city of Hannover in Germany is already testing flywheel technology for just this purpose," says Mertiny. "They have banks of flywheels at each station to capture and re-use the electricity generated when their trains come into the station." Keeping the flywheels at each station meant that Hannover's trains did not have to be retro-fitted for the development. Secanell and Mertiny are involved in a pan-Canadian Energy Storage Network investigating ways to optimize the flywheel energy storage and cost. Mertiny is also currently working with Landmark Homes of Edmonton, through the U of A's Nasseri School of Building Science and Engineering, to develop a prototype flywheel to store solar energy for household use.